Today I worked on organizing/decluttering my kids' toys. Whew! Like I mentioned earlier at this post, I have A LOT of spring cleaning to do. I started with the kids' toys because as many parents know, they multiply and take over fast! 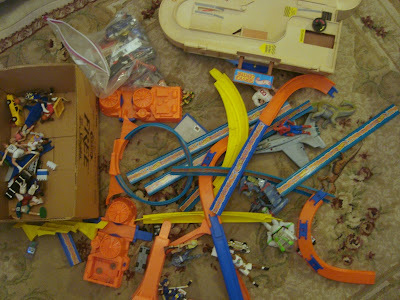 So here I am today all working on getting rid of some toys, and my husband comes home with a box of HIS old toys! I really don't mind him giving the boys his old toys, in fact I really do like it that they play with their daddy's toys. But, the timing. Oh my! Now the toys daddy gave them are all over the living room. 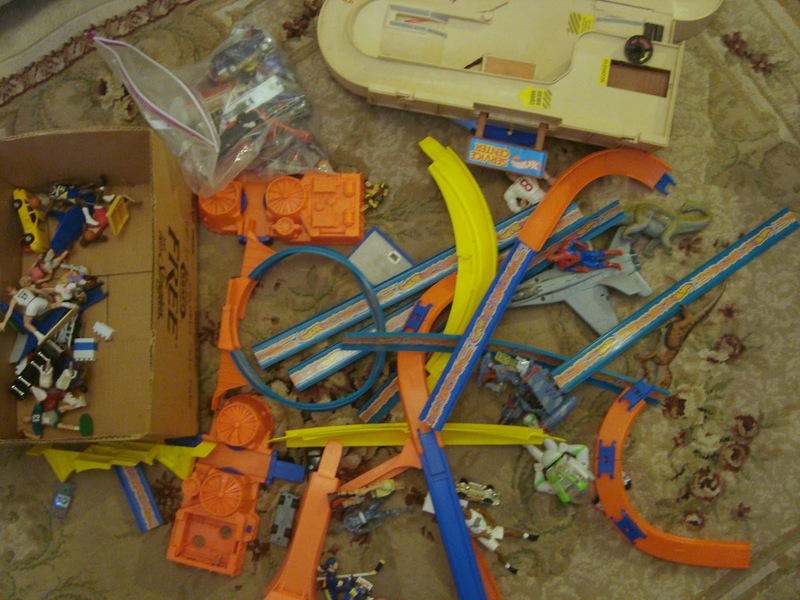 Yeah it really doesn't look like much from the picture, but there is A LOT of my husband's old toys. Lots of little toys too not even shown. 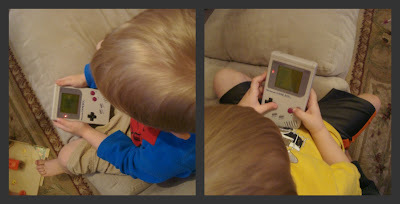 My husband found his two game boys he used to play. And I'm talking old school game boys. Our boys are only 3 and a half so they could care less that they are so old. They love them. So anyways back to organizing their toys, I still have my work cut out for me. They have about a gazillion toys and it's just craziness! I thought I could tackle all this today, but I was wrong. It looks like it may be a two day job. Tomorrow is going to be full of more toy purging. I will have some pictures in my next post to show you what I'm talking about. I'm thinking about making a trip to Target tomorrow to get something for the living room to hold a few toys. I really would like something pretty that can conceal a few toys they like to keep in the living room. Maybe an ottoman or a pretty basket? Just wondering do any of you keep some of your kids' toys in your living room? If so, do you have any kind of storage for them? Yes, we did store toys in the living room and I liked baskets with lids.